Ivy Kids, who kindly sent me this to review, are a monthly educational subscription for children ages 3-8 developed by early childhood teachers with children of their own. 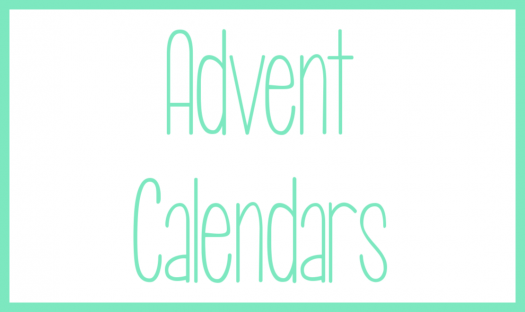 Each month you will receive a kit containing more than ten activities based upon a classic children’s book. 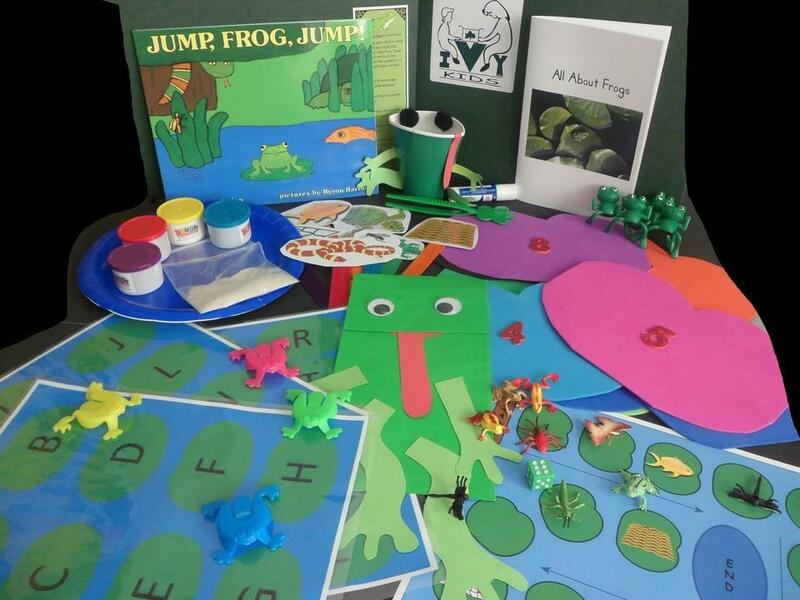 The Ivy Kids games and projects are a fun way to develop fine and gross motor muscles, build math and literacy skills, encourage reading comprehension, and promote scientific thinking. Ivy Kids ships via USPS on the 22nd of the month for ongoing subscribers and should arrive to you between 5 and 10 days after. 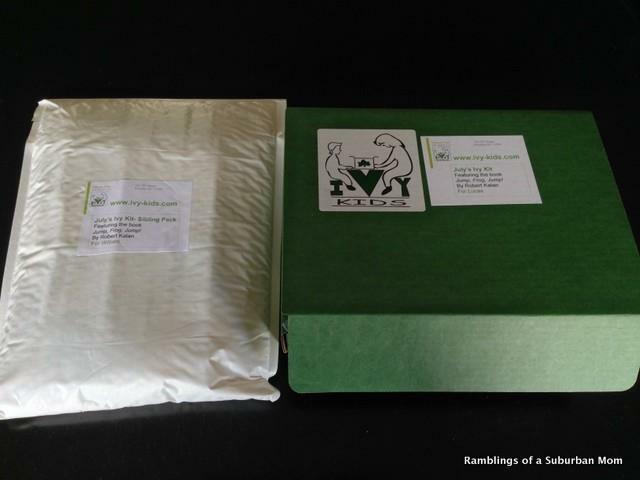 The deadline to order the July kit is June 22nd and it will ship at that time. The August kit ships on July 22nd and so on. 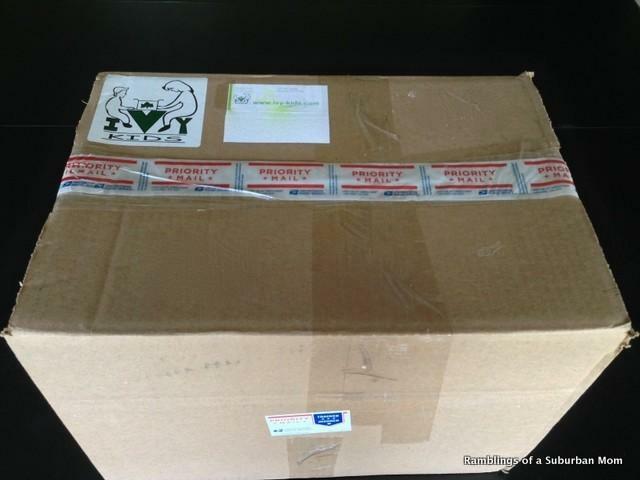 Inside the box was the actual Ivy Kids box along with a sibling pack for WB. He’s just under the age range for Ivy Kids, but can still do some of the things with my help. 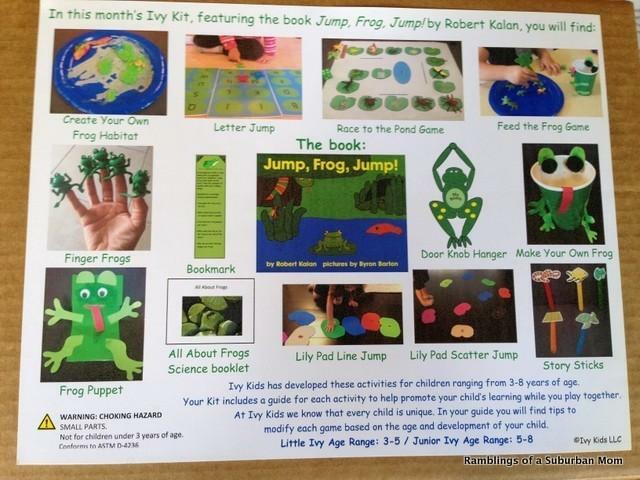 The July 2014 Ivy Kids box featured activities focused around the book “Jump, Frog, Jump”. 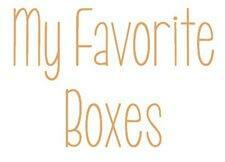 L has worked on a few of these and we have a few that we haven’t had time to do yet, but I wanted to get this review posted because there are only a few days left to pick up the July box. 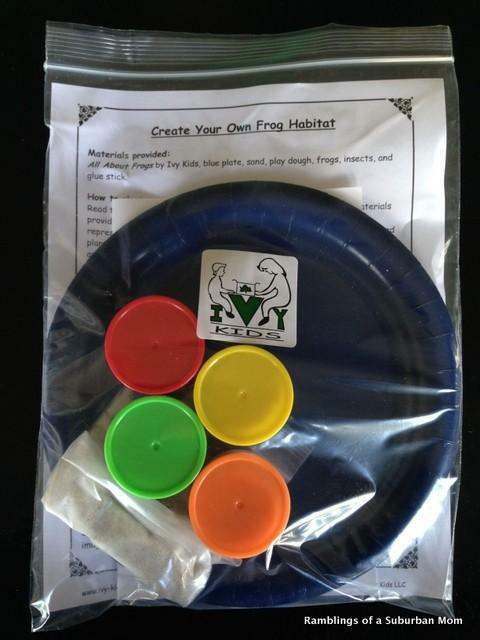 ~Create Your Own Frog Habitat: Inside this activity is a booklet with frog facts, habitat information, etc. I am going to wait till B gets home to do this one because I know that the boys will want to catch an actual frog to put in here and I want no part of that! This habitat will be located outside of course ;). ~Letter Jump: Letter Jump is quite fun! You jump your frog and whatever letter it lands on you have to identify and make that letter sound. And also say a word that starts with that letter. L is really good at this one. 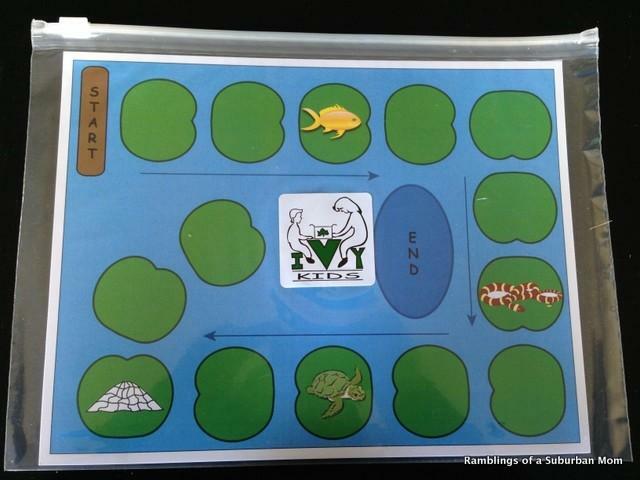 ~Race to the Pond Game: This is a fairly simply dice game which helps with counting and identifying numbers. You can put insects on the spaces to see who collects the most during the game or just see who gets to the end first. ~Feed the Frog Game: Oh I like this one! 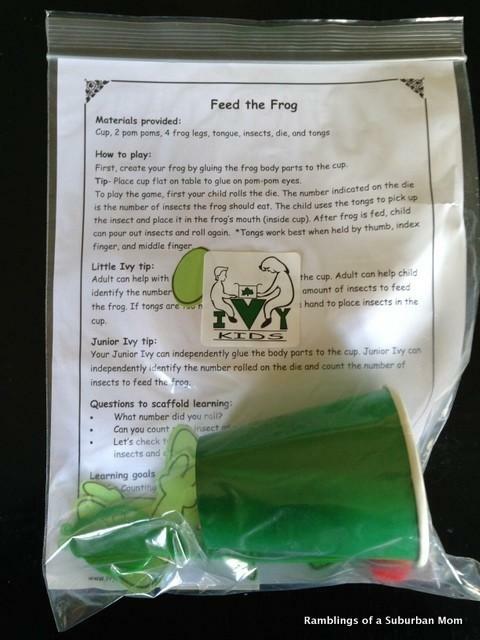 Using tongs you feed the frog (which you create out of a cup) insects which teaches fine motor skills. L is really good at stuff like this (which makes sense because he’s older), but it’s perfect for WB. 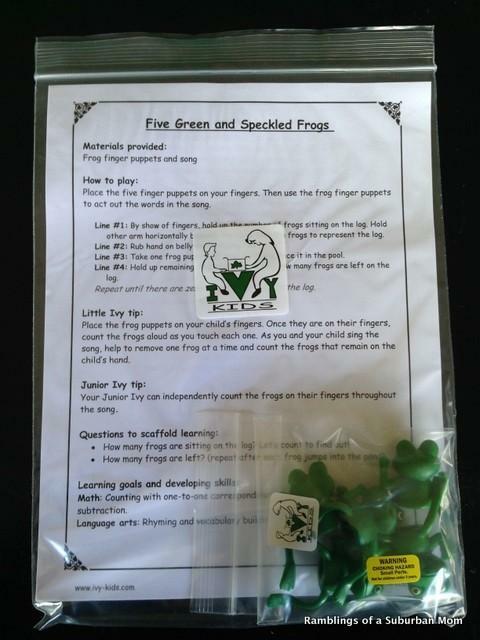 ~Five Green & Speckled Frogs: These are frog finger puppets and a song to go along with them! They have played with the frog puppets, but no one has actually tried to act out the song. Yet! 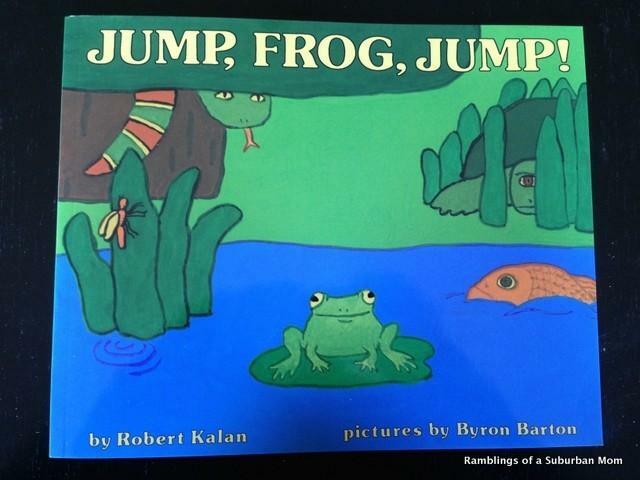 ~Jump, Frog, Jump Book: This is the book that all of the projects revolved round. The book was cute and we always like to have new books around here. 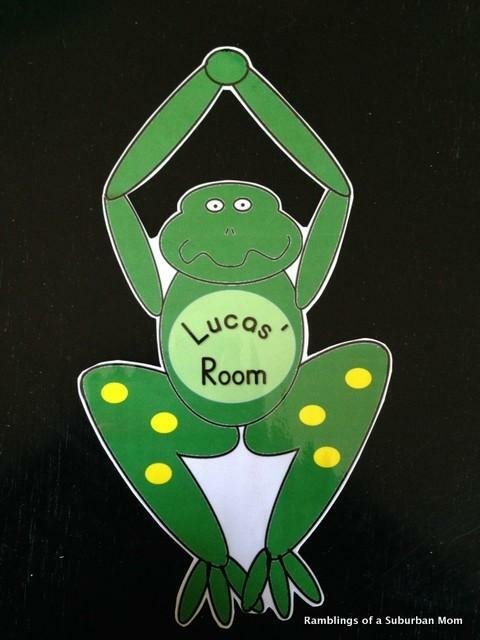 ~Door Knob Hanger: In keeping with the them, included is frog door knob hanger. I don’t think that L got that it was for a door knob and used tape to hang it up instead. 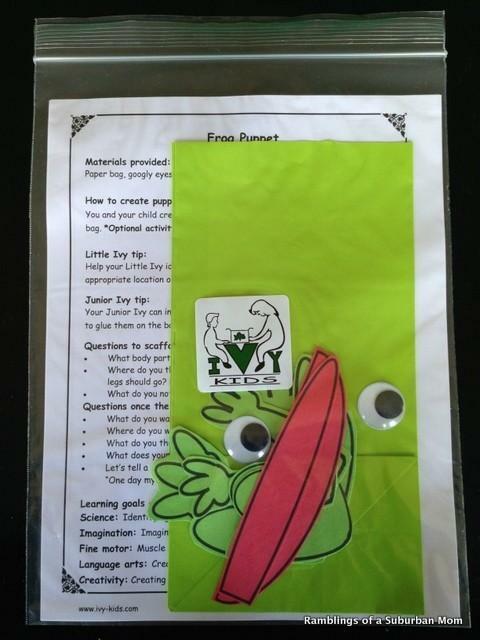 ~Frog Puppet: Included in this project is everything you need to create and decorate your own frog puppet. 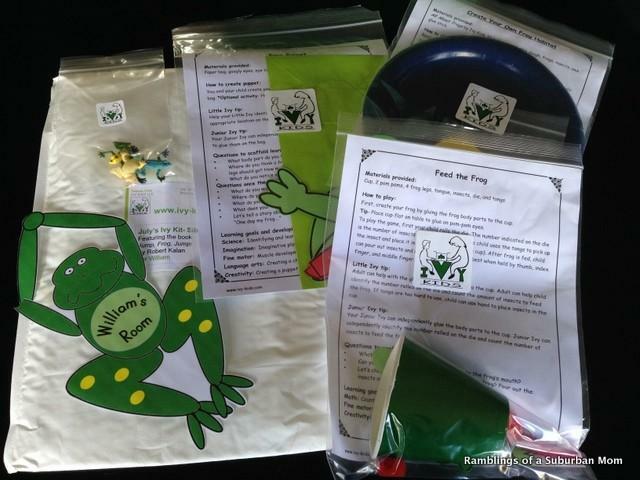 The objective is to learn about the different parts of a frog and what they are used for. 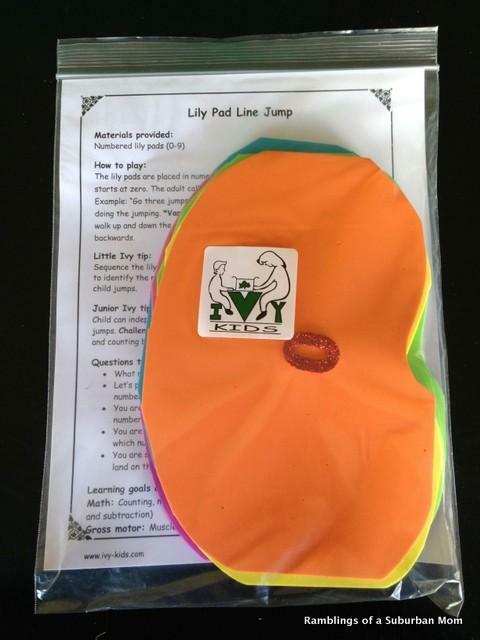 ~Lily Pad Line Jump / Lily Pad Scatter Jump: This one is designed to get kids moving and also to help with counting, addition and subscription. The lily pads are numbered and kids can jump from number to number or you have do math problems with the lily pads. 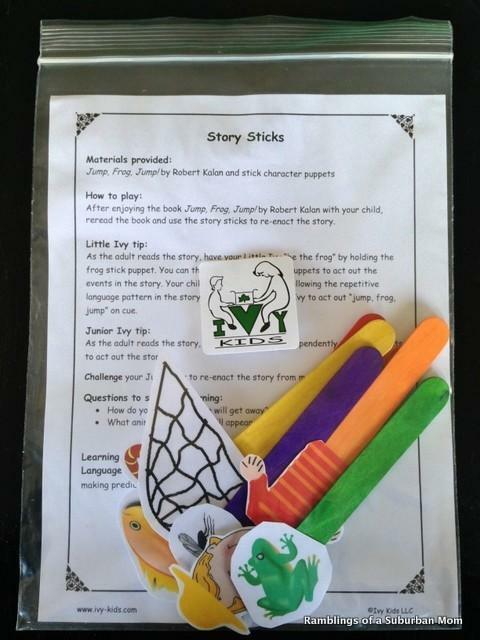 ~Story Sticks: These story sticks are based on the characters in the “Jump, Frog, Jump” book and are meant to be used to reenact the story. L and WB got a little off focus, but they still had a good time with them. 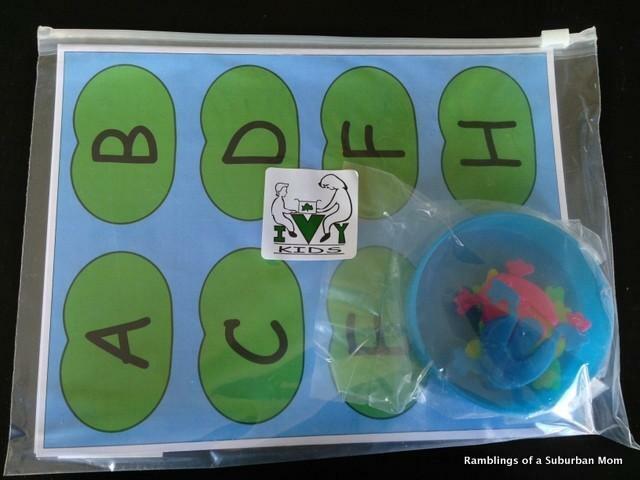 ~Sibling Materials: The sibling pack, which is an additional $5/month included three of the activities along with a personalized door hanger! I would for sure order the sibling add-on kid if I were doing this one monthly. 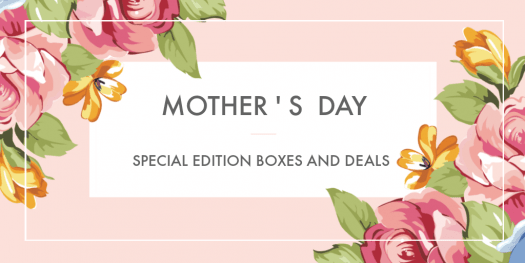 It’s a great deal and the projects included were the ones that were the crafty ones that you would need two of if you had more than one child, so it would work out well. Since all of the activities and materials were custom designed by Ivy Kids I couldn’t do a cost breakdown on this one. If you figure there were 10 different activities / projects in this one, you could break that down to $3.90 per kit which is more than reasonable! 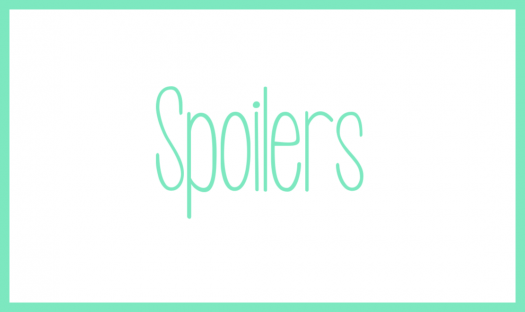 What do you think of Ivy Kids? 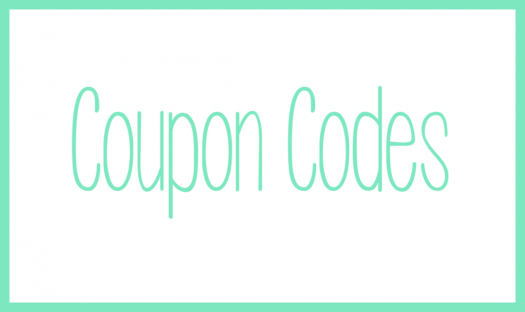 If you are interested in ordering or just want to learn more, click here. The deadline to order the July kit (which is the one) is June 22nd, so you have a few more days to get signed up! Disclosure: This complimentary box was sent for review purposes. As always, all opinions are my own and no compensation was received. This looks like a lot of fun. I keep going back and forth on it. 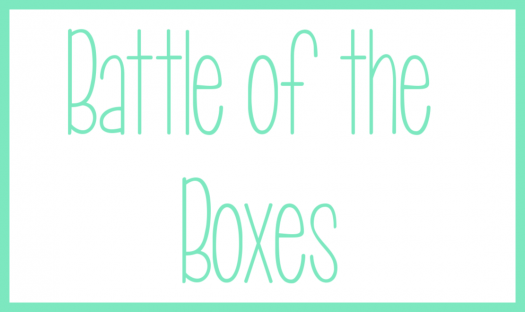 ← FabFitFun Summer Spoiler #3, Birchbox Coupon & More Subscription Box Deals!